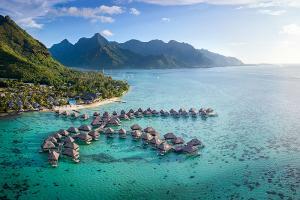 Rates are based on round-trip air travel from Los Angeles, California (LAX) to Temae, Moorea, and are subject to airline and/or resort availability. Rates quoted are per person, based on double occupancy unless otherwise stated. Advertised vacation rate(s) valid for select travel, Sunday, Monday, Tuesday, Friday departures Nov 18, 2019 - Dec 13, 2019. Please call for other travel dates.